Are y'all still there? Or did you abandon me because I haven't posted in like a week? Hopefully, you guys are still with me. I'm just going to come right out and say it: I'm sorry. I know those of you that follow my blog dutifully have been disappointed in the lack of content lately. I'm not one to make excuses, but I can honestly say that I've been crazy busy transitioning to an entirely new career field. It's been challenging, time-consuming, and most of all, rewarding. But in the process, everything for The Mane Objective has been slacking off. I'm finally beginning to achieve some semblance of balance, so I'm hoping to get back to pushing out consistent content at least 3 days a week. My goal is 4 days, but I'll make peace with 3. I'll share with you guys what it is that I'm up to really, really soon! Now let's get on with this post. Note: If you have heat damage, these steps won't work. Heat damage is irreversible, but the tips I give here might be worth trying! Pre-pooing with oil is popular among many naturals, but in the case of reverting from straight hair, it's not all that helpful. Chances are, you've applied any number of silicone-based heat protectants to your hair prior to blowing out and styling, which is good. Heat protectants are designed to to slow water loss from the hair, block humidity, and delay the transfer of heat from styling tools. Silicone serums and creams are the reason why you can run your flat ironed hair under water, and it will stay bone straight (and make your heart sink) initially. Adding oil on top of that won't do your hair any favors. Beyond that, you've likely spent the duration of your straight hair venture avoiding water and water-based products. If you wash your hair frequently (like I do) or moisturize daily, your hair is likely screaming bloody murder by the time you're ready to revert. I know my hair was. Wetting your hair down with a spray bottle and applying a moisturizing conditioner like tgin Triple Moisture Replenishing Conditioner is the ideal way to get the reversion and rehydration process started. Simply section detangle, saturate with water, and apply a generous amount of conditioner. You can sit under a hooded dryer if you like, or just don a plastic cap for about 15-20 minutes. Bonus: break out that Q-Redew! 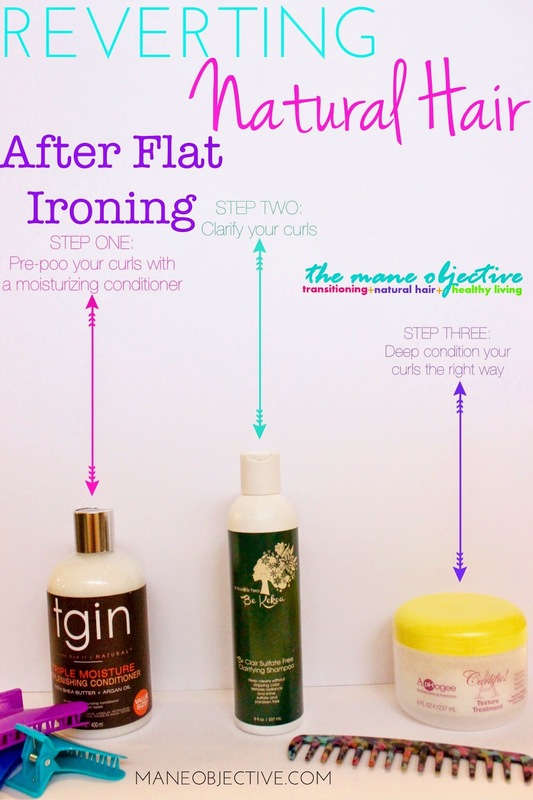 One thing you most certainly don't want to do fresh on the heels of flat ironing is co-wash your natural hair. Co-washing is great, but you really need a clarifying shampoo to get up all the humidity-blocking and anti-frizz silicones that allowed your straight natural hair to be great. I used Be Kekoa Be Clair Sulfate-Free Clarifying Shampoo, and got my curls back in one shot. My hair and scalp were clean, and my curls had returned -- all without my hair feeling dried out or stripped. When your clarifying shampoo is gentle yet effective, you can get everything with your natural hair texture back right in one shot. No need for a repeat after that lather and rinse! 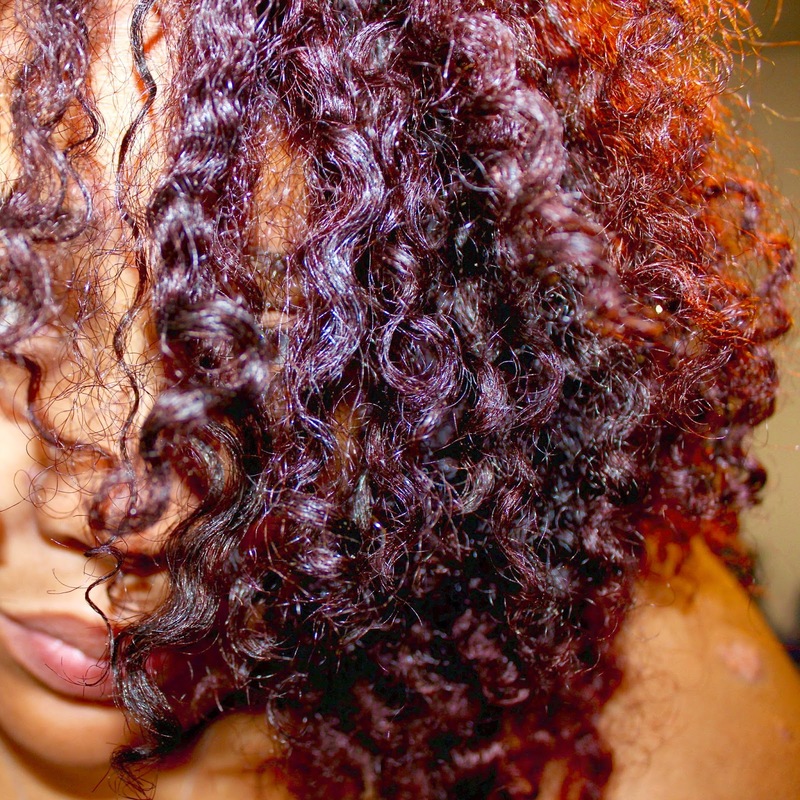 After clarifying your curls, deep conditioning is a critical step. But not just with any ol' deep conditioner. Because your hair has been devoid of moisture, subject to high heat temperatures, and bent into a structure (straight) that it's not accustomed to, having the right deep conditioner makes all the difference. To revive and re-invigorate your curls, deep condition with a product that's going to hydrate, elasticize, restore protein, soften, and smooth. My favorite all-in-one treatment for this purpose is ApHogee Texture Treatment. After 15-20 minutes with this super thick miracle worker in your hair, rinse with cool water and proceed with your regular styling regimen. 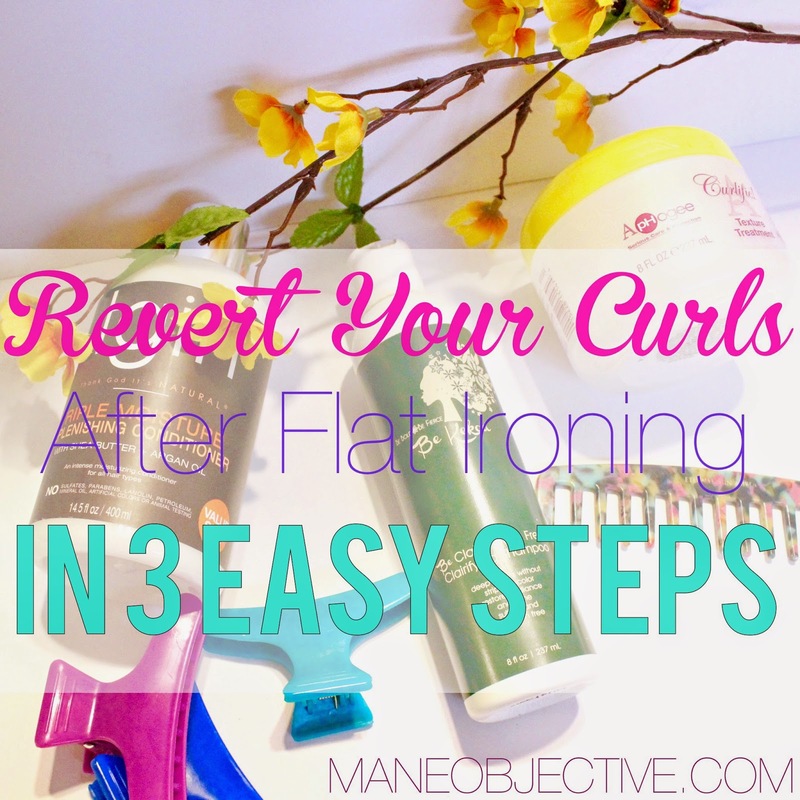 What's your process for reverting your curls after wearing flat ironed hair? This was a really great article - I forwarded article to another reader! Flat ironing has never been kind to my natural - my last salon attempt got me a head full of mid strand splits. Or... or... take a moment - go back to that BGLH article (here ya go I linked it for you http://blackgirllonghair.com/2013/09/4-ways-to-rehabilitate-natural-hair-after-using-heat/) and scroll up to the top. Who's the author there? Yep, me. It's nearly word for word in both places because it's MY content that I wrote. Next time, do your due diligence before leaving rude comments on my blog. HAHAHAHAHAHAHA!!!!! Can't believe they wrote something like that without checking their facts. How ignorant. Whew...still laughing. Great article though. I flat-ironed my hair last weekend and REALLY regret it now. Gonna try these steps and see what happens. Thanks! Do you have a picture of when your hair was damaged. Recently I went to SuperCuts to have my hair trimmed, edged and blow dryed. I went ahead and had her flat iron it since it was already straight. She used Paul Mitchell Smoothing Relax Balm to blow dry my hair, finishing oil to flat iron and their premium shampoo line to wash and deep condition using Keratin. My hair was beautiful... 2 years of new growth from the big chop and she trimmed two inches.. Hair a little past shoulders... and I thought I was the black Farrah Fawcett! One and a half weeks later after purchasing the products used on my hair and using them sparingly at home along with flat ironing my hair every day for a solid week..... I went to a natural stylist to get a flat twist/two strand twist style and to my horror, NO CURLS, EXTREMELY SOFTER THAN NORMAL HAIR (my hair is already soft as cotton and while thick as all get out my 4A head of hair is very fine), and LIMP! The naturalist used castille soap and apple cider vinegar on my hair to revert my curls... NOT HAPPENING! Thanks for your sharing, and I may like to do deep conditioning at home for my curls after taking the irons and wands. I think I found the knowledge I needed.